Unlike her father, Klara grew up on the East Coast, and her family now resides in Wallingford, Pa., a stone’s throw from Swarthmore. Peter, however, was forced to flee his native Latvia at age 4, when the Soviets and Nazis encroached on either side. Like Peter, Klara chose history as a major and is unsurprisingly interested in Eastern European politics. 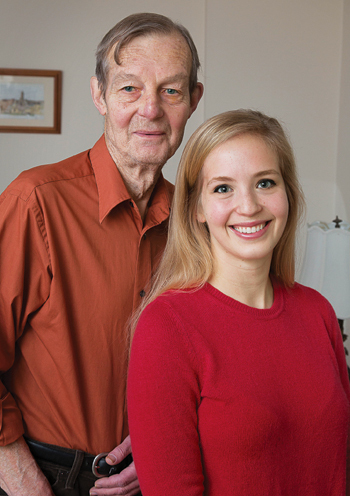 “Given [my dad’s] personal stories, I found myself wanting to learn more about why he and his family couldn’t have stayed in Latvia and the sociopolitical context surrounding all of that,” says Klara. Along with about 100,000 other Latvian refugees during World War II, Peter and his family relocated to a displaced persons camp in Germany. In 1944, as order collapsed in Germany, Peter recalls watching mass looting from a second-floor apartment. “Through bribery and various kinds of machinations,” Peter says his father managed to appropriate a steam-powered truck. Peter’s family and some fellow Latvians piled into the back of a truck and headed to the Nuremberg area. “I have no idea what kinds of papers my father was able to show,” Peter recounts. “Luckily enough, we got into the American zone and stayed around Nuremberg for four years” in a Latvian camp for displaced persons. There were many challenges, Peter explains. “The people who got out were the intelligentsia and the people who had the most to lose, so you had all of these people with time on their hands; there was no work.” The upside was that the Latvians made it a priority to set up refugee schools, which Peter attended as a young boy. But as the Russian Army caught up with the refugees in Germany, many Latvians feared being shipped back to Latvia “with a stain on their name,” explains Peter. In 1952, his family made it to New York. His mother, who’d been a doctor in Latvia, worked at a hospital on Staten Island. 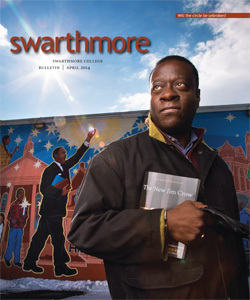 Five years later, Peter began his studies at Swarthmore. The College not only gave him a chance to study the past but also provided Peter “the best years of my life,” he says. Peter played a particularly important role at VOA in the 1980s, offering a platform for dissident Baltic voices shut out of the state-run press. “Western” broadcasters saw themselves as filling a void in Gorbachev’s purported glasnost policy of openness. Since the end of the Cold War, Peter has traveled back to Latvia many times, often with Klara. Klara is also fluent in Latvian, partly thanks to her father’s efforts to read her Latvian translations of Harry Potter books as a child. Her favorite aspect of visiting Latvia as a daughter and history student is “exploring the side streets and different neighborhoods. There’s this huge monument that celebrates the end of World War II that the Soviets erected in 1985, and I’ve become really fascinated with that lately,” says Klara, who believes the monument brings Russian and Latvian issues to the forefront. The visits to his land of origin have been fascinating to Peter for other reasons: Latvians recognize his voice from the radio. Decades after being forced to leave his homeland, Peter has come full circle, all the while maintaining his language and love of history.